From left: Kaylee Scheer, Lindsay Kuntz, Chelsea Mellenthin, Karyn Plumm, Ashley Vigen, Alma Pierce, Amanda Peters and Shannon Sporbert Webber. The team of core advisors are set to increase student retention and graduation rate through seamless, consistent advising across campus. Photo by Dima Williams/UND Today. Hunched over hundreds of LEGO pieces one late January morning, they ferreted for the ones that would help them construct a visual representation of their job at the University of North Dakota. Split in two teams for the exercise, part of their initial on-boarding, the seven newly hired academic core advisors erected models – complete with tiny yellow LEGO humans – that evoked students support, perseverance, collaboration and goal attainment. It’s a complex job, after all, one that spills across campus but, yet, anchors to a College. 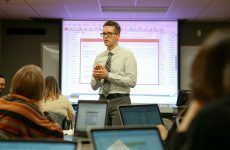 “Each of these seven core advisors will be working with the Colleges [and their existing advisors], primarily to increase retention and to help them work on recruitment and different advising practices,” said Karyn Plumm, assistant vice provost for student success, who oversees the core advisors. UND Provost and Vice President for Academic Affairs Tom DiLorenzo offered an even more vivid job description – student success innovators. A new concept at UND, the core advisors, all of whom started their work in January, will uphold the University’s strategic objective of boosting student retention and graduation rates. In doing so, they will function as agents who glue the University’s seven colleges and its administration. 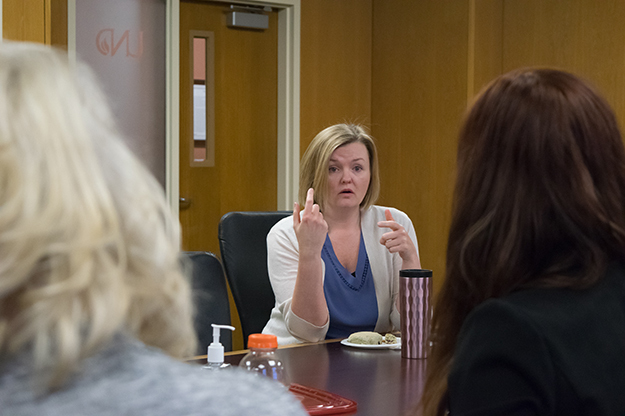 Assistant Vice Provost for Student Success Karyn Plumm leads the seven-strong crew of core advisors, who started their work this January. Photo by Dima Williams/UND Today. While they will function as a cohesive team, the core advisors will work closely with and individually contribute to different colleges, said Plumm, adding that assignments are to be completed by the first full week of February. Some colleges, she said, need an expert to serve as a secondary advisor for students, in addition to faculty and professional mentors. Others seek a hand with student recruitment. Yet others need someone to help students realize and utilize various academic, degree-shaping technologies. The idea for core advisors sprang up during the Fall 2018 semester, triggering a campus-wide review of how to weld two distinct advising models. One approach dictates a single, centralized advising operation that serves various disciplines, while the other leaves advising to the Colleges. UND strove for a hybrid that works for students, advisors, faculty and administrators alike. 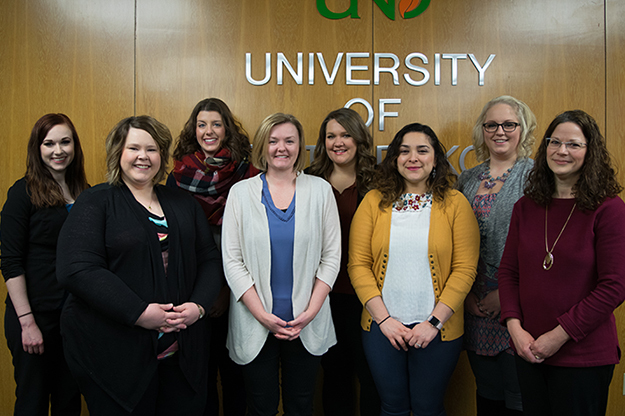 The seven core advisors – who came together from other UND offices as well as other regional universities – are to serve an array of populations, including nontraditional learners, online enrollees and transfer students among others. Each of the core advisors brings a well of knowledge in specific fields – recruitment, academic probation, student programs, financial assistance and major selection, to name a few – that the rest can dip into. 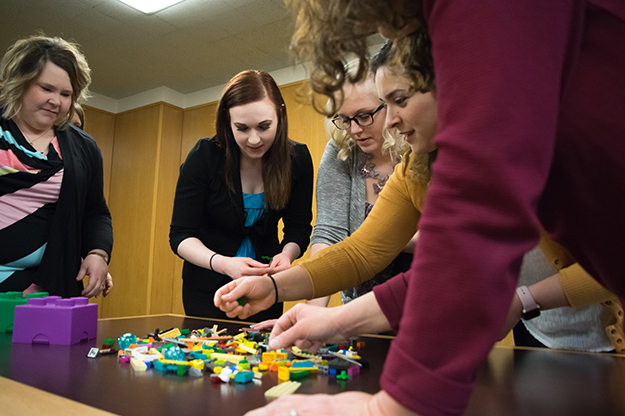 The core advisors engaged in a teamwork exercise on Jan. 18, seeking LEGO pieces that would help them best represent the essence of their job. Photo by Dima Williams/UND Today. Each grasps the value and responsibility of the job. To an extent, Alma Pierce learned it when she was on the receiving end of counsel. In the classrooms of UND, she was a nontraditional, first-generation student and a single mom. University advisors helped her navigate the often clashing commitments of earning a degree and raising children. UND’s new core advisors also understand firsthand the challenges faced by their advising counterparts in the Colleges – that is because most have been there before. 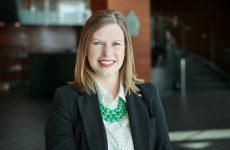 Ashley Vigen guided students across 17 programs in the College of Business & Public Administration, while Chelsea Mellenthin tended to psychology students. In the Student Success Center, Kuntz worked with students yet to declare majors. 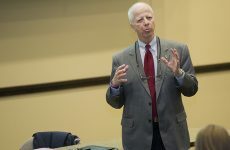 “Because we had such a large caseload, I was not able to work on big-picture things like retention, recruitment and trying to ramp up different programs,” Vigen said. Core advisors will now be able to support these crucial tasks of UND’s strategic plan. College-specific projects and across-campus collaborations will fill out their schedules, which, while still evolving, are meant to complement the efforts of the traditional faculty and academic advisors.